Introduction: The relation between Behçet's disease (BD) and breast cancer (BC) is unclear. Our purpose is to investigate whether BD has an important effect on BC or vice versa. Patients and Methods: A total of 12 female BC patients with a diagnosis of BD were identified from a cohort including 5050 BC patients. The demographic data of the selected patients including previous chemotherapy (CT), radiotherapy (RT), hormonal therapy (HT), drugs used for BD, history of thrombotic events, and overall survival were examined. Results: The rate of BD in the entire cohort was found to be 0.25% (12/4800), and all had early BC at the time of BC diagnosis, with a median age of 47 years (range: 38–51). All patients underwent curative surgery for BC. In the adjuvant setting, CT, RT, and HT were administered in 11 (91%), 10 (83.4%), and 9 (75%) patients, respectively. All patients received acetylsalicylic acid and colchicine for BD. No serious adverse event associated with BC and/or BD was observed. Clinical symptoms in 11 patients with BD were observed to be improved following the BC treatment. Only one patient developed disease progression and then expired. Conclusion: Unlike the natural behavior of BD, which is well-defined to have an increased risk of thrombosis, BC patients with BD in this study did not have any adverse event. However, due to small sample size, it is difficult to drive any definite conclusion regarding the relation between these two pathologies. BD is a multisystem, autoinflammatory vasculitis which is mainly characterized by increased predisposition to thromboembolic events, eye involvement, and recurrent orogenital ulcers with neutrophilic inflammation. As compared with the European and American populations, its incidence is significantly more common in Asian countries, with the highest incidence reported in Turkey. Although the main pathogenesis is not well clarified, the genetic locus consisting HLA-B51 allele is considered to have an important key role in the pathophysiology. The incidence of arterial versus venous involvement in BD is reported to be 5% versus 15–30%, respectively, whereas microvascular involvement has been shown to be present in nearly all patients. The vascular involvement of brain is the major cause of mortality and morbidity in BD. Disease- or treatment-related complications in patients with either BC or BD such as thrombosis and bleeding are more frequently documented as compared to healthy people. Today, the clinical importance of BD in the etiology of BC is still uncertain. However, it is known that there is a high tendency to thrombosis in patients with BC due to the increased rate of coagulation disorders associated with CT, RT, paraneoplastic events, and tamoxifen. Colchicine is effective and standard of care in the long-term treatment in patients with BD, whereas acetylsalicylic acid (ASA) or warfarin is more widely used in the treatment of thrombosis.,,, The most efficient immunosuppressive (IS) agents used in BD are steroids, cyclosporine, and azathioprine. Long-term use of these agents with an IS dose, but not higher dose, has not yet been shown to have a carcinogenic effect., However, it is accepted that IS agents and steroids used in BD may also have a role in disease progression or disease recurrence in BC. Herein, we intended to perform a demographic study of BC and BD in light of the literature reviews, with the goal of investigating the likelihood impacts of BD on BC or vice versa. Medical records of 5050 patients with BC followed between 1997 and 2016 were retrospectively analyzed. Of the patients, 12 female BC patients who had either subsequent or previous diagnosis of BD were enrolled into this study. Demographic data and clinicopathologic features of BC patients with a diagnosis of BD were evaluated. Six of the patients, who were diagnosed with BD prior to BC diagnosis, were known to receive IS agents for systemic involvement; however, data regarding the treatment of these patients could not be used in this study since the information was not properly recorded. The median age of 12 patients was 47 (range: 38–56) years, and the time until BC was 14 (range: 1–36) years. All patients underwent surgery of either modified radical mastectomy or breast-conserving surgery plus axillary lymph node dissection with a curative intent. Except a mild degree and clinically insignificant lymphedema which developed only in three patients, none of the patients experienced any other treatment-related complication. Nine (75%) patients had a hormone-positive tumor, hence received adjuvant aromatase inhibitor (18%) or tamoxifen (63%). Of the 12 patients, 11 (91%) were treated with CT in the adjuvant setting and 1 was treated in the neoadjuvant setting. 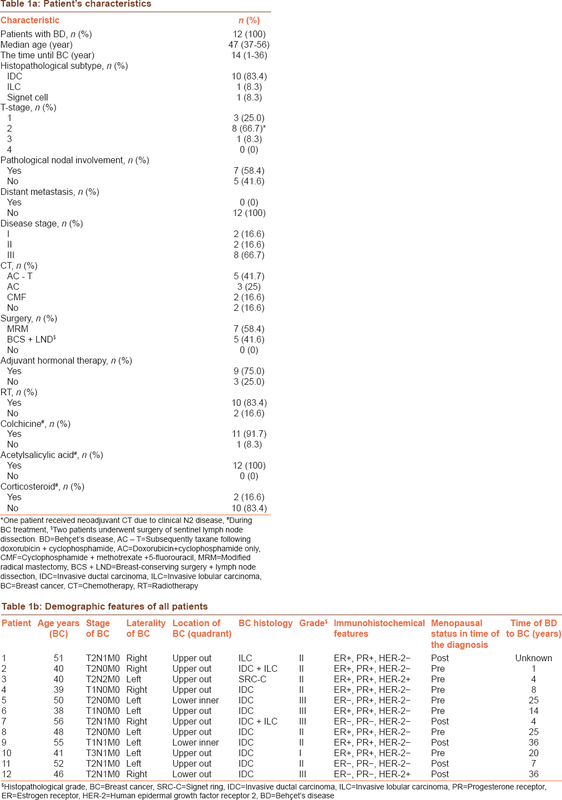 Detailed demographic data and histopathological characteristics of patients are shown in [Table 1]a and [Table 1]b Ten (83.3%) patients were given adjuvant RT without occurring any adverse event. 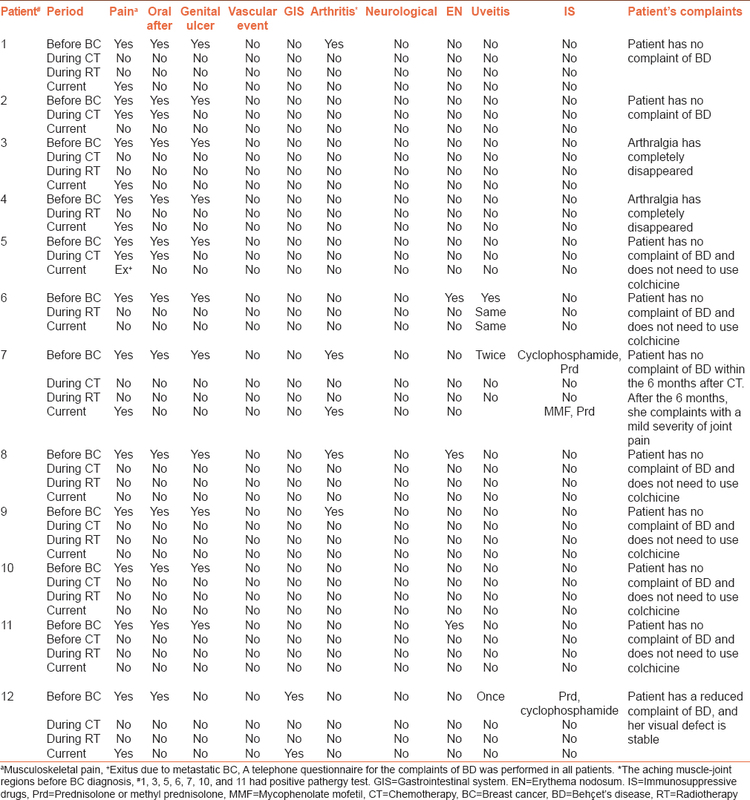 The treatments during and after the diagnosis BC shown in [Table 2]. There was no case of secondary primary malignancy at the baseline or at follow-up. No thromboembolic event due to BC or BD developed in the 12 patients. Only one patient had BC recurrence and expired due to disease progression. The clinical outcomes of both disease shown in [Table 3]. There was no new case of uveitis, neurological attack, and end-organ involvement due to BD during or following BC treatment. Moreover, the oral-genital ulcers and erythema nodosum were completely regressed in nearly all patients following CT, except in one patient in whom complaints continued at a moderate level. In addition, the need for IS drugs and colchicine therapy were reduced in a majority of the patients following CT [Table 4]. Our findings regarding the incidence rate of BD among BC patients were similar to general incidence reported for Turkey and other East Asian populations.,, However, among a retrospective series of BC patients, of patients who also had a previous diagnosis of BD disease (n = 12), it would be difficult to speculate on “incidence of BD in BC patients.” Thus, it is apparently difficult to drive any definite conclusion regarding the etiological relation between BD and BC. On the other hand, it would also be possible to hypothesize in our patients that there was no increased risk of recurrence or increased rate of locoregional/metastatic disease due to BD; however, the study was limited by a small number of patients, hence required a large sample size to make such a certain conclusion. In our study, while some patients with BD had used IS therapy prior to the BC diagnosis, none of them required further IS therapy during BC treatment, and only one patient needed IS therapy after the BC treatment. Besides, patients with BD did not have any relapsing episode or end-organ involvement following the BC diagnosis. This might be partly due to the IS effects of CT, particularly cyclophosphamide. In literature, data regarding the incidence of BD among cancer patients are available for the last two decades. Therefore, recently discovered–IS agents used in BD may play a role in the development of cancer disease. Few studies have reported that incidence of autoimmunity may increase in patients with cancer or may lead to the development of some specific cancer types., By contrast, there are also available data suggesting that autoimmunity may have an effect in decreasing the incidence of some cancer types. For instance, the low incidence rate of malignant melanoma in patients with vitiligo is a typical and considerable example for this risk reduction. Besides, it has been shown that the recurrence rate in BC is not increased in patients with AiD. However, these studies regarding the relation between cancer and autoimmunity have not included the patients with BD and have not investigated the association of BD with malignancies. In a retrospective analysis by Hemminki et al. totaling approximately 200,000 patients diagnosed with any of 33 different types of autoimmune disorders, a low-frequency rate of BC was reported among patients with AiD, however, any effect of BD on BC patients could not be shown in terms of recurrence, complication, and survival. A surveillance, epidemiology, and end results analysis by Gadalla et al. including 84,778 women patients aged between 67 and 79 reported that systemic AiD did not lead to an increase in BC incidence. In addition, same authors reported that AiD decreased the incidence of hormone negative-BC which has a poorer prognosis than hormone positive-BC. Accordingly that the incidence rate of BD prior to the BC diagnosis in our study was similar to those reported for the general population. Moreover, none of our patients experienced a secondary primary cancer before or after BC diagnosis, reflecting an insignificant relation between BD and BC. The lower likelihood of recurrence risk or disease progression in our BC patients with BD might be explained with the increased T-cell response due to autoimmunity which is inherent in BD. One another hypothesis for the decreased recurrence risk in patients with BD might be due to the use of colchicine treatment which is widely used in the treatment of BD. Colchicine acts as a microtubule inhibitor, with a similar activity as taxanes which are commonly used in the treatment of BC. In addition, data regarding the use of colchicine as a chemotherapeutic agent in cancer treatment are currently available. For instance, there are few studies indicating that colchicine might be effective in the treatment of metastatic hepatocellular and cholangiocellular carcinoma., Furthermore, Kuo Ming-Chun et al. found that long-term use of colchicine in patients with gout reduced the incidence rates of cancer development (hazard ratios = 0.85, 95% confidence interval = 0.77–0.94; P = 0.001). Nowadays, multiple colchicine derivatives have been synthesized for the cancer treatment. One another noteworthy finding of this research was that BC patients with BD were likely to be at earlier ages at BC presentation. This might be explained with close follow-up intervals in these selected patients. However, it is important to note that our sample size is inconclusive to make a judgment regarding on this issue. The incidence of lymphedema following BC surgery was likely to be in mild degree with an expected frequency in BC patients. It is also important to note that BC patients with BD using an intense CT or hormonal therapy (HT) (such as tamoxifen and letrozole) in the adjuvant or metastatic setting are under a high risk of developing thrombosis; however, none of our patients experienced any thrombotic event during or following BC treatment. This finding may partly be attributed to the chronic use of ASA treatment in these group of patients. In some retrospective studies, RT during AiD has been shown to lead to an increased incidence of lung pathologies, scarring, and tissue necrosis., Unfortunately, the data concerning the relation between RT side effects and BD are limited in the literature. Only one BC patient with BD was reported to have a severe skin necrosis related to RT. By contrast, none of our patients had such a side effect during or after RT. Cyclophosphamide is effectively used in AiDs at a much lower dose as compared to those used in the treatment of other cancer types such as BC. Furthermore, novel targeted therapies or conventional chemotherapeutic agents have been shown to provide some clinical improvements through IS effects in AiD. For instance; interferon, natalizumab, rituximab or high-dose cyclophosphamide in multiple sclerosis; high-dose cyclophosphamide in autoimmune aplastic anemia; etanercept and infliximab in BD; rituximab in systemic lupus erythematosus; and methotrexate in rheumatoid arthritis. In our study, the treatments used in BC did not have any objective or subjective negative impact on the prognosis of BD. On the contrary, we observed that CT was likely to be associated with a durable complete recovery in the clinical findings of BD. Aside from its retrospective nature, the most important limitation of our study was that the numbers of cases were too small to drive a definite conclusion or to make a comparative statistical analysis. One another important limitation was the lack of data regarding the quality of life for both diseases. We were therefore unable to demonstrate whether BD has any negative or positive impact on the quality of life in BC or vice versa. We did not observe any negative effect of Behçet's disease on BC or vice versa. CT regimens (such as cyclophosphamide, adriamycin, and taxane) or HT (such as tamoxifen) may safely be given in BC patients with BD using colchicine treatment. Despite the multiple etiological factors predisposing to increased risk of thrombosis in these patients, ASA alone seems to be safe and also has enough therapeutic efficacy in preventing the vascular events. Finally, colchicine treatment might have a potential role as an anticancer drug in BC. However, more prospective studies including a large number of patients are warranted with the goal of identifying possible effects of BD on BC prognosis or vice versa. Franks AL, Slansky JE. Multiple associations between a broad spectrum of autoimmune diseases, chronic inflammatory diseases and cancer. Anticancer Res 2012;32:1119-36. Abu-Shakra M, Buskila D, Ehrenfeld M, Conrad K, Shoenfeld Y. Cancer and autoimmunity: Autoimmune and rheumatic features in patients with malignancies. Ann Rheum Dis 2001;60:433-41. Cengiz M, Altundag MK, Zorlu AF, Güllü IH, Ozyar E, Atahan IL. Malignancy in Behçet's disease: A report of 13 cases and a review of the literature. Clin Rheumatol 2001;20:239-44. Colaci M, Giuggioli D, Vacchi C, Lumetti F, Iachetta F, Marcheselli L, et al. Breast cancer in systemic sclerosis: Results of a cross-linkage of an Italian rheumatologic center and a population-based cancer registry and review of the literature. Autoimmun Rev 2014;13:132-7. Robertson JM, Clarke DH, Pevzner MM, Matter RC. Breast conservation therapy. Severe breast fibrosis after radiation therapy in patients with collagen vascular disease. Cancer 1991;68:502-8. Wallace GR. HLA-B*51 the primary risk in Behçet disease. Proc Natl Acad Sci U S A 2014;111:8706-7. Yazici H, Fresko I, Yurdakul S. Behçet's syndrome: Disease manifestations, management, and advances in treatment. Nat Clin Pract Rheumatol 2007;3:148-55. Sitnikov NS, Sinzov AV, Allegro D, Barbier P, Combes S, Onambele LA, et al. Synthesis of indole-derived allocolchicine congeners exhibiting pronounced anti-proliferative and apoptosis-inducing properties. Medchemcomm 2015;6:2158-62. Lin Y, Li G, Zheng W, Tian X, Zhang F. Behcet's disease associated with malignancy: A report of 41 Chinese cases. Int J Rheum Dis 2014;17:459-65. Roach EC, Petekkaya I, Altundag K. Behcet's disease and breast cancer. Breast J 2014;20:566-7. Kaklamani VG, Tzonou A, Kaklamanis PG. Behçet's disease associated with malignancies. Report of two cases and review of the literature. Clin Exp Rheumatol 2005;23 4 Suppl 38:S35-41. Wang LH, Wang WM, Hsu SM, Lin SH, Shieh CC. Risk of overall and site-specific cancers in Behçet disease: A nationwide population-based study in Taiwan. J Rheumatol 2015;42:879-84. Haddad TC, Greeno EW. Chemotherapy-induced thrombosis. Thromb Res 2006;118:555-68. Wood SC, Tang X, Tesfamariam B. Paclitaxel potentiates inflammatory cytokine-induced prothrombotic molecules in endothelial cells. J Cardiovasc Pharmacol 2010;55:276-85. Woodley-Cook J, Shin LY, Swystun L, Caruso S, Beaudin S, Liaw PC. Effects of the chemotherapeutic agent doxorubicin on the protein C anticoagulant pathway. Mol Cancer Ther 2006;5:3303-11. Kim SH, Lim KM, Noh JY, Kim K, Kang S, Chang YK, et al. Doxorubicin-induced platelet procoagulant activities: An important clue for chemotherapy-associated thrombosis. Toxicol Sci 2011;124:215-24. Lipton A, Harvey HA, Hamilton RW. Venous thrombosis as a side effect of tamoxifen treatment. Cancer Treat Rep 1984;68:887-9. Saphner T, Tormey DC, Gray R. Venous and arterial thrombosis in patients who received adjuvant therapy for breast cancer. J Clin Oncol 1991;9:286-94. Cushman M, Costantino JP, Bovill EG, Wickerham DL, Buckley L, Roberts JD, et al. Effect of tamoxifen on venous thrombosis risk factors in women without cancer: The breast cancer prevention trial. Br J Haematol 2003;120:109-16. Pritchard KI, Abramson BL. Cardiovascular health and aromatase inhibitors. Drugs 2006;66:1727-40. Onal S, Tugal-Tutkun I. Behçet disease. Uveitis: An Update. India: Springer; 2016. p. 17-31. Tuzun H, Seyahi E, Arslan C, Hamuryudan V, Besirli K, Yazici H. Management and prognosis of nonpulmonary large arterial disease in patients with Behçet disease. J Vasc Surg 2012;55:157-63. Saleh Z, Arayssi T. Update on the therapy of Behçet disease. Ther Adv Chronic Dis 2014;5:112-34. Takeno M, Ideguchi H, Suda A, Kamiyama R, Ishigatsubo Y. Vascular involvement of Behçet's disease. Behçet's Disease. Japan: Springer; 2015. p. 79-100. Connell WR, Kamm MA, Dickson M, Balkwill AM, Ritchie JK, Lennard-Jones JE. Long-term neoplasia risk after azathioprine treatment in inflammatory bowel disease. Lancet 1994;343:1249-52. Confavreux C, Saddier P, Grimaud J, Moreau T, Adeleine P, Aimard G. Risk of cancer from azathioprine therapy in multiple sclerosis: A case-control study. Neurology 1996;46:1607-12. Penn I, Starzl TE, editors. Immunosuppression and Cancer. Transplantation Proceedings. NIH Public Access; 1973. Kaneko F, Nakamura K, Sato M, Tojo M, Zheng X, Zhang JZ. Epidemiology of Behcet's disease in Asian countries and Japan. Adamantiades-Behçet's Disease. Japan: Springer; 2004. p. 25-9. Sakane T, Takeno M, Suzuki N, Inaba G. Behçet's disease. N Engl J Med 1999;341:1284-91. Azizlerli G, Köse AA, Sarica R, Gül A, Tutkun IT, Kulaç M, et al. Prevalence of Behçet's disease in Istanbul, Turkey. Int J Dermatol 2003;42:803-6. Tan TT, Coussens LM. Humoral immunity, inflammation and cancer. Curr Opin Immunol 2007;19:209-16. Tomer Y, Sherer Y, Shoenfeld Y. Autoantibodies, autoimmunity and cancer (review). Oncol Rep 1998;5:753-61. Teulings HE, Overkamp M, Ceylan E, Nieuweboer-Krobotova L, Bos JD, Nijsten T, et al. Decreased risk of melanoma and nonmelanoma skin cancer in patients with vitiligo: A survey among 1307 patients and their partners. Br J Dermatol 2013;168:162-71. Lietzen LW, Cronin-Fenton D, Christiansen P, Sørensen HT, Lash TL. Autoimmune diseases and breast cancer recurrence: A Danish nationwide cohort study. Breast Cancer Res Treat 2015;149:497-504. Hemminki K, Liu X, Ji J, Försti A, Sundquist J, Sundquist K. Effect of autoimmune diseases on risk and survival in female cancers. Gynecol Oncol 2012;127:180-5. Gadalla SM, Amr S, Langenberg P, Baumgarten M, Davidson WF, Schairer C, et al. Breast cancer risk in elderly women with systemic autoimmune rheumatic diseases: A population-based case-control study. Br J Cancer 2009;100:817-21. Sivakumar G. Colchicine semisynthetics: Chemotherapeutics for cancer? Curr Med Chem 2013;20:892-8. Lin ZY, Wu CC, Chuang YH, Chuang WL. Anti-cancer mechanisms of clinically acceptable colchicine concentrations on hepatocellular carcinoma. Life Sci 2013;93:323-8. Wu CC, Lin ZY, Kuoc CH, Chuang WL. Clinically acceptable colchicine concentrations have potential for the palliative treatment of human cholangiocarcinoma. Kaohsiung J Med Sci 2015;31:229-34. Kuo MC, Chang SJ, Hsieh MC. Colchicine significantly reduces incident cancer in gout male patients: A 12-year cohort study. Medicine 2015;94:e1570. La Regina M, Gasparyan AY, Orlandini F, Prisco D. Behçet's disease as a model of venous thrombosis. Open Cardiovasc Med J 2010;4:71-7. Hölscher T, Bentzen SM, Baumann M. Influence of connective tissue diseases on the expression of radiation side effects: A systematic review. Radiother Oncol 2006;78:123-30. Chargari C, Kirova YM, Fourquet A, Campana F. Severe acute radiation-related skin toxicity in a breast cancer patient with Behçet's disease. Radiother Oncol 2009;91:139. Zack E. Chemotherapy and biotherapeutic agents for autoimmune diseases. Clin J Oncol Nurs 2012;16:E125-32.